Citra® brand HBC 394 is a special aroma hop released by the Hop Breeding Company in 2007. 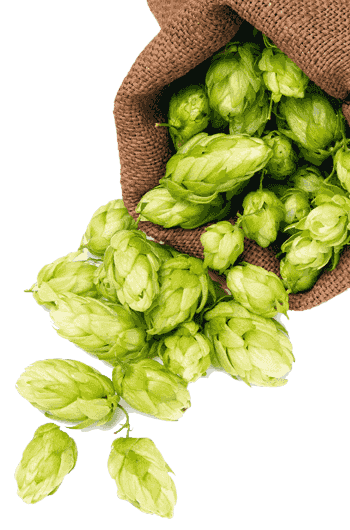 Citra hops have fairly high alpha acids and total oil contents with a low percentage of cohumulone content. 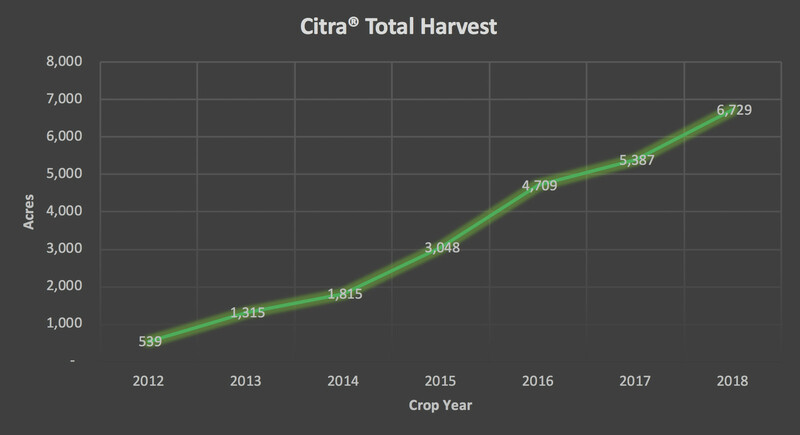 Citra hops impart interesting citrus and tropical fruit characteristics to beer, making them one of the most popular brand of hop varieties in the US in recent years. 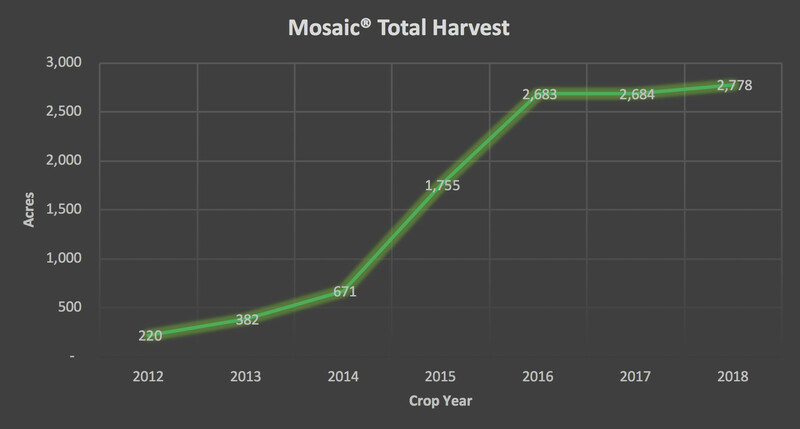 Mosaic® brand HBC 369 was released in 2012 and is the second most popular aroma hop variety developed by the Hop Breeding Company. Mosaic hops offer a unique and complex blend of floral, tropical, fruity, and earthy characteristics that translate very favorably into several styles of beer. Mosaic is the daughter of the Simcoe® brand YCH 14 hop variety and a Nugget-derived male. 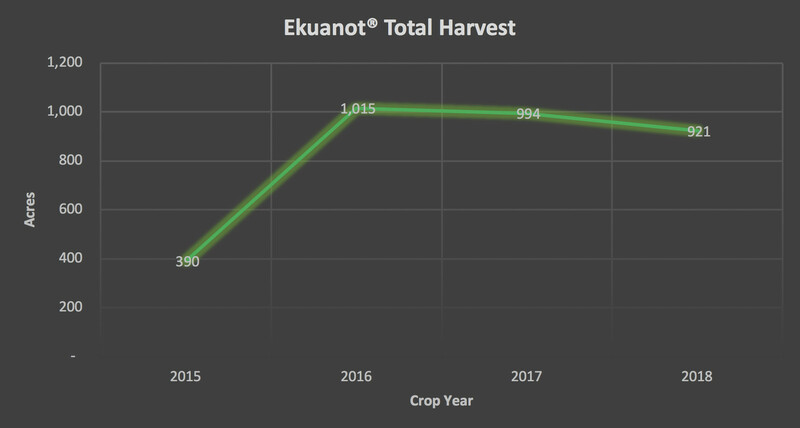 Bursting out of the spring soil with a vibrant yellow, Ekuanot® brand HBC 366 matures to a deep green by fall harvest. Ekuanot® features a high oil content and dynamic aroma characteristics, including melon, berry, citrus-lime, apple, papaya, and green pepper. 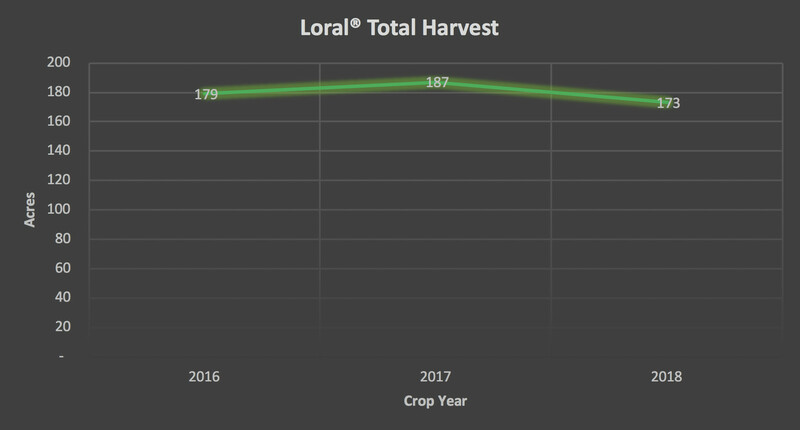 Loral® brand HBC 291 was released by the Hop Breeding Company in 2016. With a noble heritage, Loral straddles the fence between old and new world hop aromatics and is truly complementary to all styles of beer. Loral hops have a very pleasant floral, peppery, citrus aroma, with some dark fruit character. Sabro™ brand HBC 438 is the newest aroma hop release from the Hop Breeding Company. Sabro is notable for its complexity of fruity and citrus flavors. It imparts distinct tangerine, coconut, tropical fruit, and stone fruit aromas, with hints of cedar, mint, and cream. Sabro’s pedigree is the result of a unique cross pollination of a female neomexicanus hop. With a robust brewing performance, Sabro proves to be a strongly expressive hop that translates its flavor incredibly well into beer. 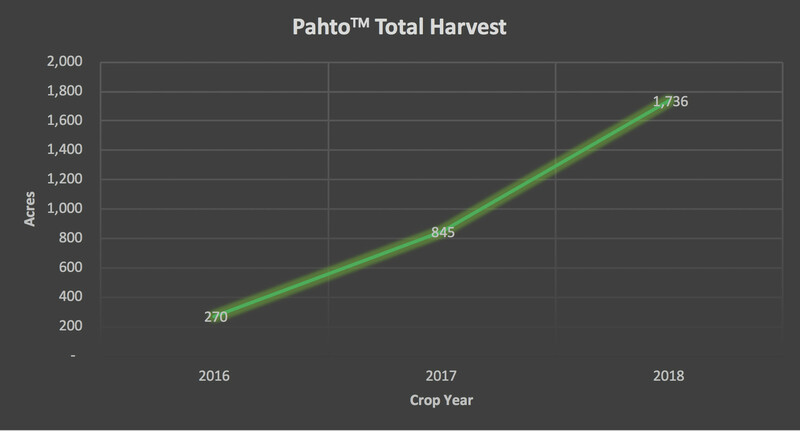 Pahto™ brand HBC 682 is the first high-alpha bittering hop released by the Hop Breeding Company. Pahto delivers a smooth bittering profile with mild, pleasant aromatics. The aroma profile of the hop cone is described as herbal, earthy, and floral. When used as a bittering hop, Pahto provides a very neutral flavor and a pleasant bitterness to beer. Formed in 2003, the Hop Breeding Company, LLC (HBC) is a joint venture between John I. Haas, Inc. and Yakima Chief Ranches, L.L.C. (YCR) Our mission is to develop pest-resistant and disease-resistant hop varieties with strong commercial qualities. YCR was started in the late 1980’s by the Carpenter, Smith, and Perrault families, with the YCR breeding program under the direction of the late Charles “Chuck” Zimmerman. Initial breeding results were fruitful, leading to the selection of Ahtanum® brand YCR-1, Palisade® brand YCR-4, Warrior® brand YCR-5, and Simcoe® brand YCR 14. John I. Haas, Inc. was founded in 1914. The company owns and operates its own hop farms, warehouses, pellet and extraction plants as well as isomerization facilities in the northwestern United States. The Haas breeding program has released several varieties, including Millennium and Chelan. By bringing these breeding programs together, HBC can take advantage of increased efficiencies through consolidation of facilities, germplasm, knowledge, and innovation. ©2018 Hop Breeding Company • Yakima Chief Ranches, LLC • John I. Haas, Inc. • All rights reserved.